This is the circuit diagram of a two channel audio line driver using the high performance dual opamp IC TSH22 from ST Microelectronics. The 25 MHz bandwidth, low distortion and high output current of the IC makes it possible to drive medium impedance loads at a high level of modulation. Here both of the opamps inside the IC are wired as non inverting amplifiers with 3X gain, one for each channel. Input line 1 is connected to the non inverting input of IC1a and input line 2 is connected to the non inverting input of IC1b. The non inverting inputs of the opamps IC1a and IC1b are pulled to a slight positive voltage using the R1 and R9 respectively. 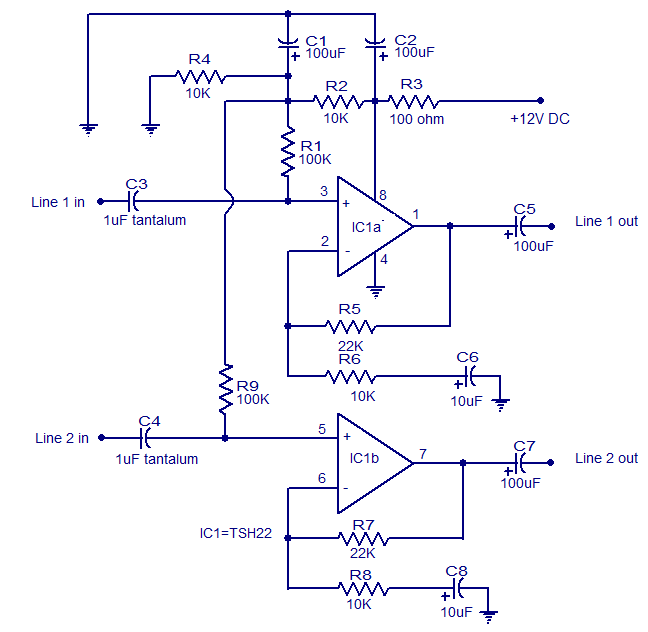 The resistance R4 and R2 are used to make a phantom ground at half the supply voltage. At 12V supply, a 600 ohm impedance line can be driven at +10dBm with a distortion less than 0.05% at 1kHz. Gain of line 1 can be set using the equation, Gain1 = (R5+R6)/R6. Gain of line 2 can be set using the equation, Gain2 = (R7+R8)/R8. The load at the output must be at least 100 ohms in order to avoid stability issues.